A typical night at the Hampton House. Circa 1958. Courtesy of Historic Hampton House Community Trust. 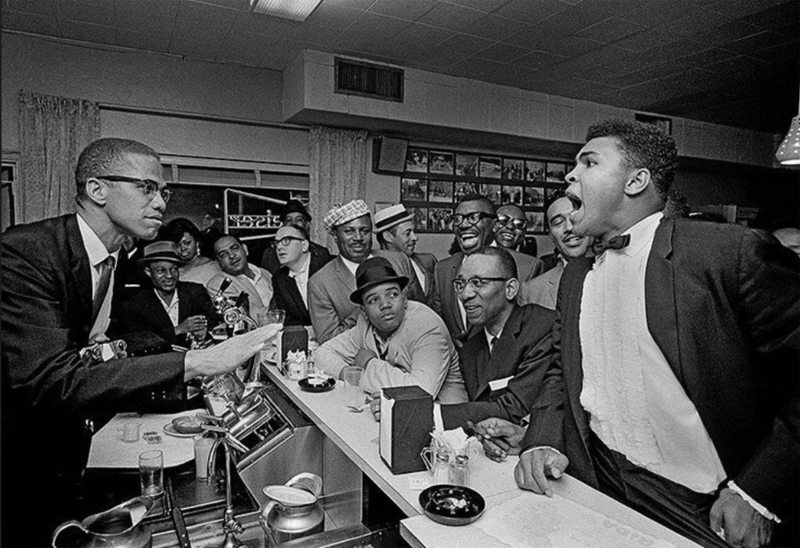 Malcom X converts Cassius Clay to Muhammad Ali at the Hampton House. Circa 1964. Dr. Martin Luther King Jr. at the Hampton House. Circa 1961. Courtesy of Historic Hampton House Community Trust. Introduction to The Historic Hampton House. 4:27 min. Video Production: Katja Esson, Penelope Pictures. Courtesy of Historic Hampton House Community Trust. 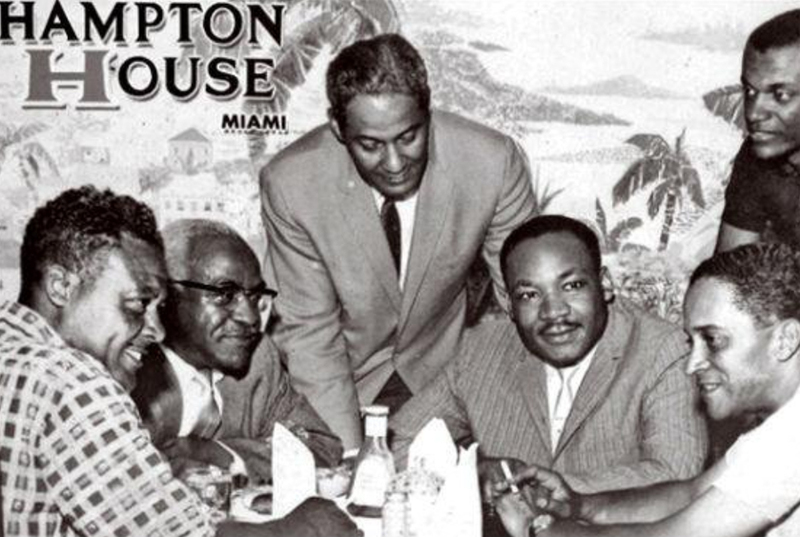 In the 1950s and ’60s, when Miami Beach was still segregated and African-Americans were not allowed to sleep there, the Hampton House Motel was an oasis for African-American leaders, activists, performers, and professional athletes, including Dr. Martin Luther King Jr., Sammy Davis Jr., Duke Ellington, Nancy Wilson, Louis Armstrong, LaVern Baker, Malcolm X, and Muhammad Ali. In the beginning of the 21st century, a group led by Dr. Enid Pinkney began a more than 15-year journey to raise funds, make plans, and oversee the restoration of the Hampton House, which has now been designated a historic site called “The Historic Hampton House.” With an assortment of grants and a small army of people from the Brownsville community, faculty and students from Florida International University and the University of Miami, plus other volunteers, The Historic Hampton is once more a source of indelible memories and an inspiration to young and old. In 1954, the Booker Terrace Motel opened in Miami, Florida, to satisfy the city’s growing need for Black lodging facilities. It was renamed the Hampton House Motel in 1961, and operated for a total of just over 20 years. During that short period, the motel played an important role as the most convenient location with public accommodations and lodging available to Black travelers visiting Miami via Miami International Airport. After the passage of the Civil Rights Act of 1964, however, the Hampton House lost much of its core clientele and closed in 1976. Once described as the “Jewel of Black Miami,” the Hampton House Motel was a unique and important site. 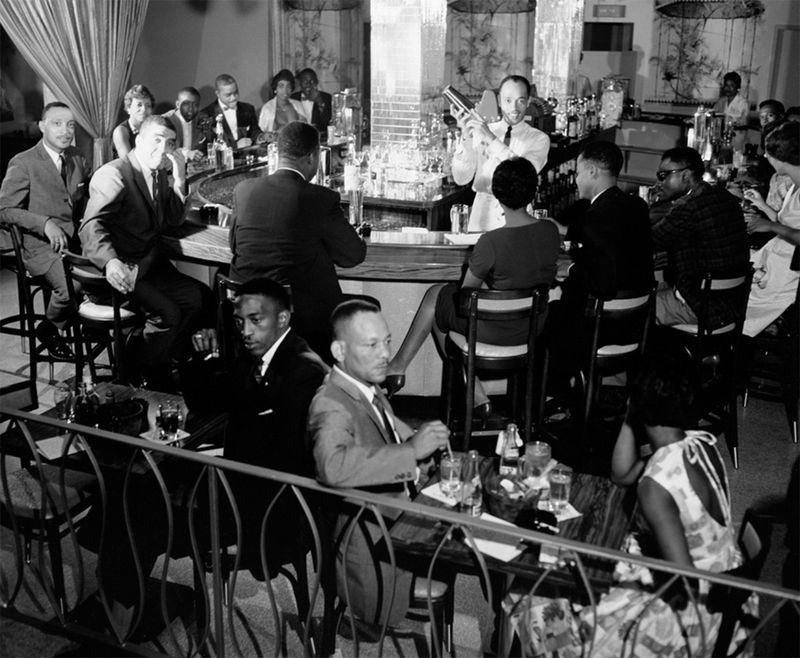 The Hampton House was among the most modern and upscale facilities available to Blacks in Miami before desegregation. And in an era when hospitals, schools, and beaches were segregated, the Hampton House was open to people of all races. Furthermore, it was a center of local and national political, civic, and cultural activity. One only needs to speak to people who visited the hotel during its years of operation to understand how much the swirl at the Hampton House captured and inspired imaginations. In February, 2018, in the hotel room at the Historic Hampton House where Muhammad Ali used to stay in the early 1960s and in the room where Dr. Martin Luther King, Jr used to stay, we recorded video interviews with people who grew up in the Brownsville area and were either patrons of the Hampton House or shunned it. The videos below are organized by topic and run between 30 seconds and 7 minutes. Click on any video. You must be connected to the Internet to view the videos. Describe your experience as the wife of Muhammad Ali visiting and staying at the Hampton House hotel, when Miami Beach was still segregated. Introduction to Patricia Thomas. 1:13 min. Do you remember the first time you heard about The Hampton House? There were a lot of important performers, athletes, and politicians who stayed at The Hampton House. What was it’s reputation during it’s prime? You met Muhammad Ali when you were in your early twenties. What was it like to see him in Brownsville? Who are some of the other performers that you remember from The Hampton House? Besides enjoying the music in The Hampton House, were there any other kinds of events that you attended? DR. DOROTHY JENKINS FIELDS: 6:56 min. Introduction to Dr. Dorothy Jenkins Fields. 6:56 min. DR. DOROTHY JENKINS FIELDS: 4:59 min. You come from a prominent, well-educated family. What was your experience of The Hampton House? DR. DOROTHY JENKINS FIELDS: 5:23 min. Did you come to The Hampton House to interact with movement leaders like Dr. Martin Luther King Jr and Malcom X? DR. DOROTHY JENKINS FIELDS: 1:42 min. 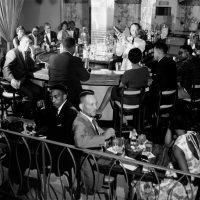 Was there anything like the Harlem Renaissance in this community? DR. DOROTHY JENKINS FIELDS: 6:02 min. Did you feel privileged growing up? DOROTHY ROSS SMITH: 3:47 min. DOROTHY ROSS SMITH: 1:06 min. It must have been more fun to see the biggest name musicians perform at The Hampton House after they finished their gigs to white audiences on Miami Beach. Who were some of the biggest stars you saw at The Hampton House? What was your most memorable night at the Hampton House? What were your feelings the first time you entered The Hampton House? What does it mean to you to see The Hampton House come back to life? NEAL ADAMS JR: 1:07 min. Introduction to Neal Adams Jr.
NEAL ADAMS JR: 2:40 min. Did you meet or see some of the celebrities who stayed at the Hampton House? NEAL ADAMS JR: 1:57 min. When you were growing up you worked 16 hour days, 7 days a week, in your family grocery store. Were things different for your children? NEAL ADAMS JR: 1:06 min. Tell us about the Brownsville Association. EARLENE DONNA ADAMS: 0:17 sec. Introduction to Earlene Donna Adams. EARLENE DONNA ADAMS: 2:55 min. What is your earliest memory of the Hampton House? EARLENE DONNA ADAMS: 0:42 sec. What was it like to grow up in Brownsville?